A few months ago Manda from Mae & Co Creative messaged me through Instagram and invited me to her upcoming StyledYou worksop/shootout at the Ace Hotel in Portland. And of course seeing tons of photos floating around Instagram on events/weddings that she's designed and styled, I had to reply with a huge freakin YES! 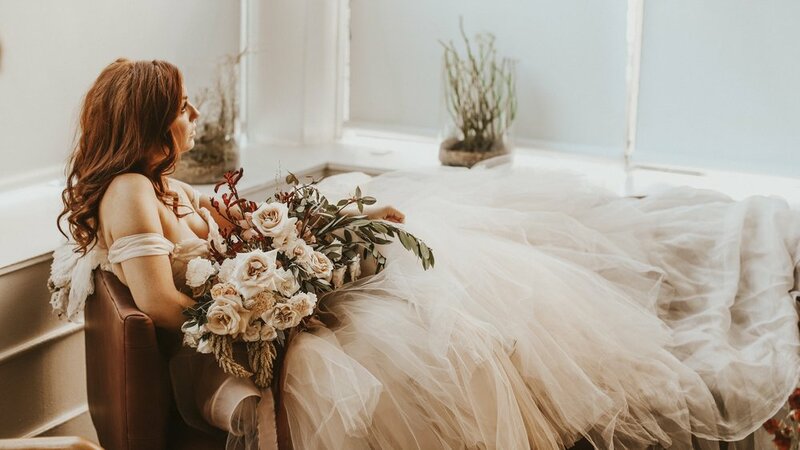 The styled shoot was rustic Italian dream inspired, and Manda sent out a mood board to all the wonderful ladies a few weeks before to give us an idea of what everything would look like. But to be totally honest everything was WAY beyond what I had expected. Manda totally transformed the studio and styled/designed everything so perfectly, paying attention to each and every detail. Reed Alyson + her hunny Jon absolutely killed it modeling for everyone in romantic and whimsical bridal attire from Claire La Faye. And can we talk about how the heck the ladies from Good Seed floral were able to install a huge, and I mean HUGE floral garland creation from the ceiling!? I have no idea, but honestly it was so inspiring to see such talented local vendors come together to create absolute MAGIC together for us to photograph! !